I decorate like a 13 year old girl. It’s true. Case in point? 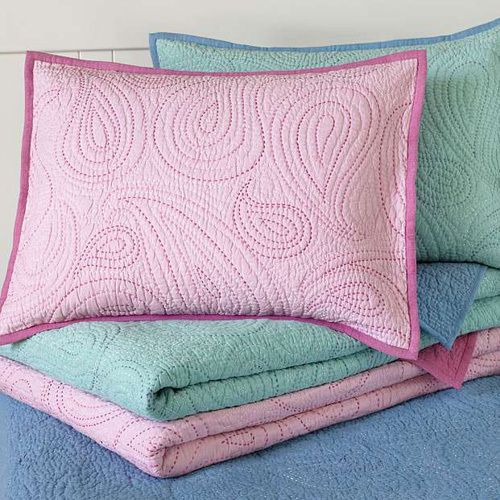 The new quilt and pillow covers I bought from PB teen, the Paisley Pick-Stitch Quilt & Sham (on sale!). And which color did I get? Like you can’t guess. Pink, of course. Or, maybe I decorate like a 6 year old girl… I haven’t figured it out yet. Why, you may ask? 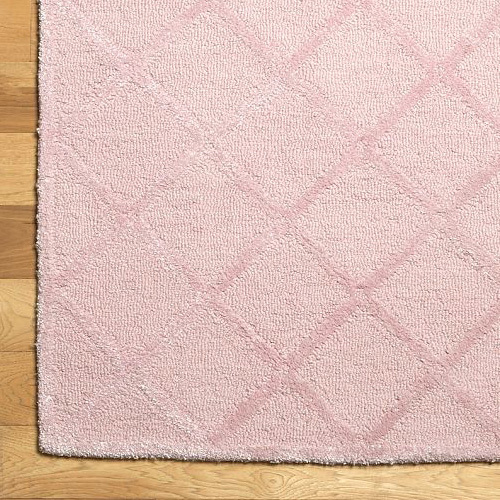 I’m very seriously considering the Pink Trellis Rug from Pottery Barn Kids (KIDS!). I think it would look mighty fine in the living room. It’s because I like pink. Trends are so fickle, and when pink is not “in”, it’s hard to find. Well, hard to find for adults. You can count on teens, tweens, and children to love it forever and ever. What’s funny though, is that when I was younger… I HATED the color. Abhorred it. Now I can’t get enough. Previous Post Butterflies for Sale! i have pb kids in my guest room – not juvenile, just pretty. and pb teen in my 7 year old’s room – not too grown up, just sweet. and white eyelet from pb bed and bath in my 5 year old’s room. it spans all ages in my opinion. Half the furniture in my bedroom is from PB Kids (so much cheaper than grown-up PB! ), and I love Teen. Have you seen their desk lamps lately? So cute! there’s something comforting about it all. I really like the pink trellis rug. it’s a basic, in a not so basic color. sort of funky in a way. I also hated pink when I was little. I’m still not head-over-heels for it (I wouldn’t use it as part of a color scheme in my home) but I do wear very pale versions of it sometimes. That said, I am hugely in love with peach, which I think of as pink, but a little more original. If you think pink’s hard to find, try looking for peach! Pink is soulful… it exudes beauty, desire & gentle love. I adore it, and what a perfect season to showcase it! Ha, ha, I have thought that about myself many times. The things I am drawn to are for teenagers. I love the teenager section at Target. I actually saw a pink ottoman for $29! Where else could you find something like that. I have loved pink my entire life. For me it is the best color in the whole world. Yet lately I’ve been using a lot of blue and orange. i love your blog!!! i feel completely identified a) i’m a graphic designer too b) i’ve recently become a firt time home owner myself c)i have a blog documenting my decoration process as well. i’m adding you right now as one of my links! you’re welcome to visit anytime!! !